A decision tree is a flowchart-like structure in which each internal node represents a "test" on an attribute (e.g. whether a coin flip comes up heads or tails), each branch represents the outcome of the test and each leaf node represents a class label (decision taken after computing all attributes). The paths from root to leaf represents classification rules. We get a decision tree using training data: Abe, Barb, Colette and Don. And we can get the Home value of Sally using this decision tree. 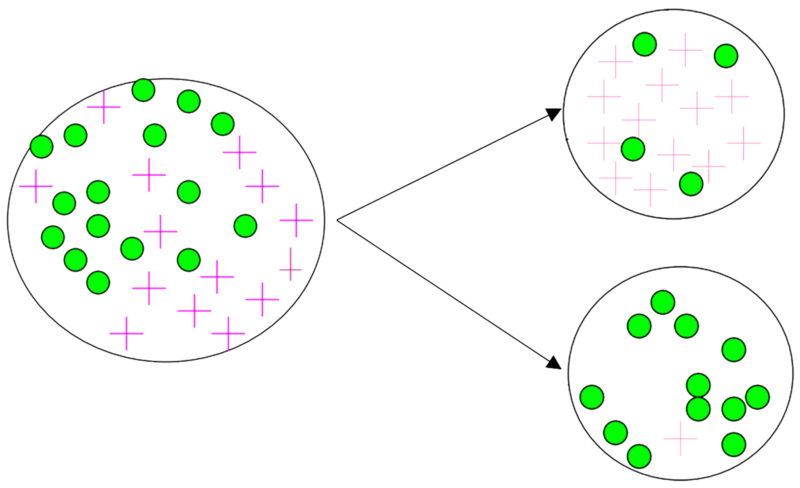 The entropy (very common in Information Theory) characterizes the impurity of an arbitrary collection of examples. Information gain ratio overcomes the bias of information gain, and it applies a kind of normalization to information gain using a split information value. where \(p_i\) is the probability that a tuple in D belongs to class \(C_i\) and is estimated by \(|C_i, D| / |D|\). The sum is computed over m classes. A Gini index of zero expresses perfect equality, where all values are the same; a Gini index of one (or 100%) expresses maximal inequality among values. ID3 (Iterative Dichotomiser 3) is an algorithm used to generate a decision tree from a dataset. The ID3 algorithm begins with the original set S as the root node. On each iteration of the algorithm, it iterates through every unused attribute of the set S and calculates the entropy H(S) (or information gain IG(A)) of that attribute. It then selects the attribute which has the smallest entropy (or largest information gain) value. The set S is then split by the selected attribute (e.g. age < 50, 50 <= age < 100, age >= 100) to produce subsets of the data. So, we'll choose Outlook attribute for the first time. For the node where Outlook = Overcast, we'll find that all the attribute(Play ball) of end nodes are the same. For another two nodes, we should split them once more. So, we'll choose Humidity attribute for this node. C4.5 builds decision trees from a set of training data in the same way as ID3, using an extension to information gain known as gain ratio. The CART(Classification & Regression Trees) algorithm is a binary decision tree algorithm. It recursively partitions data into 2 subsets so that cases within each subset are more homogeneous. Allows consideration of misclassification costs, prior distributions, cost-complexity pruning. Firstly, we calculate the Gini Index for Buy House. How to deal with attributes with more than two values? Then choose the split with minimum Gini index. How to deal with continuous attributes? So the value(Tax Income = 95) with minimum Gini index will be chose as split node. The values will be split into two nodes: Tax Income > 97 and Tax Income <= 97. Overfitting results in decision trees that are more complex than necessary. Training error no longer provides a good estimate of how well the tree will perform on previously unseen records. Need new ways for estimating errors.